Best stones for Outdoor Grill Areas? The latest trends in outdoor living spaces don’t just feature the same design style and color palette, they mirror the functionality of the indoor rooms as well. Innovative all-weather furnishings and appliances let the outdoors act as an extension of the home, and homeowners have begun to seek out ways to extend the usefulness of outdoor spaces and therefore their outdoor time as well. Be prepared when your customers come in looking for granite for their outdoor kitchen and grilling area. SlabMarket can help you select the most popular granites for your inventory. 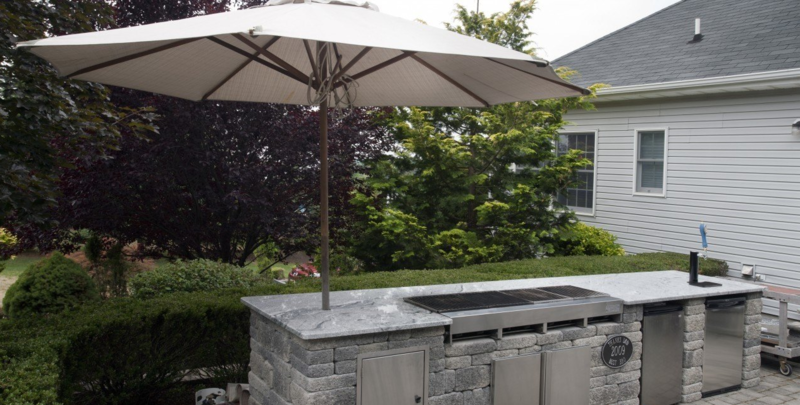 Outdoor spaces have evolved into sophisticated entertainment areas and fully functioning outdoor kitchens and grilling areas with granite countertops, as shown above. Grilling and dining al fresco are long-time traditions, where food preparation often required going back and forth between the indoor kitchen and the outdoor dining area – until now. Finally, outdoor kitchens and grilling areas are living up to their names, with fully appointed work zones, outfitted with water, electricity, granite countertops, appliances, refrigeration, and all of the related conveniences. In the outdoors, the wrong materials will become obvious very quickly. When choosing outdoor countertops, the first priority should be durability. Adequate counter space for an outdoor kitchen or grilling area is also critical. A total of 36 feet of counter that’s 24 inches deep is the recommended minimum, and when it comes to outdoor spaces, not all natural stone is created equal. For example, porous stones such as marble and limestone might look fantastic when first installed, but they’re prone to staining and scuffing. Granite, such as the Giallo Napole granite pictured below, is one of the most popular, and durable, choices. Granite can withstand the elements, doesn't absorb stains or odors as easily as some other stones (when properly sealed with a product like AGM Sealers from Mr. Stone), and resists fading. Sometimes granite can have sun damage over time especially when you choose lighter colors. Additionally, darker granites tend to absorb heat, so a mid-range color is the best recommendation. We recommend shaded areas. Slate can be extremely durable and stain resistant and can handle certainly handle heavy use, however, no two slate slabs are the same and the stone's performance may vary. If you have a customer whose heart is set on slate countertops, they can be recommended, but other natural stones will perform better. Slate is also prone to chipping, so if the area receives a lot of heavy use, maybe you should try granite. TIP: Engineered, or “man-made” stone products such as quartz should not be recommended for outdoor use because the resin in the top coat turns yellow after being in the sun. In conclusion, outdoor kitchens and grilling areas are gaining in popularity and your inventory should be ready to meet the demand. The professionals at SlabMarket.com can assist you with your order to ensure your container includes exactly what you need for your business. Contact us today.